WHEN WILL I RECEIVE MY ORDER? If you are in the UK, your order will be delivered by Royal Mail Monday – Saturday and will require a signature upon delivery. Express orders take 24 – 48 hours to be delivered (if ordered by 12pm Monday – Friday) and standard delivery usually takes 3 – 5 days but can sometimes take longer in busy periods. AM I ABLE TO TRACK MY ORDER? Yes. Once we dispatch your order for delivery you will receive a unique tracking number by email. Once you receive the tracking number you can check the status of your shipment. For all UK deliveries please use Royal Mail and for all international please use DHL to track your delivery. DO I HAVE TO PAY DUTY AND IMPORT CHARGES? Currently we deliver all international orders without duties paid therefore you may be subject to custom and/or duty taxes. This cost is the responsibility of the customer and is payable on receipt of delivery of goods. Currently all orders under $800 US do not incur any import duties/taxes however this can vary from state to state. Please check your local custom tax and duty costs as duties must be paid before the goods are delivered. WHAT IS THE RETURNS POLICY? We offer you a full refund if the order is returned within 28 days for any product(s) that is in a new and unworn condition with all packaging and garment tags still attached. We cannot accept any used items and any such items will be returned to the purchaser. HOW LONG WILL IT TAKE TO PROCESS MY REFUND? Although we endeavour to process returns as quickly as possible returns can take 2-3 days to be processed once received in our warehouse and then can take up to 7 days for the refund to be processed. The refunded money should usually show in your bank account within 3 business days but can take up to 10 business days to be received by certain banks. CAN I TRACK MY RETURN? If you are within the UK you can track your return by entering the tracking number here. If you are returning an item from outside the UK please ensure you keep reference of your tracking number. HOW DO I RETURN OUTSIDE OF THE UK? Currently we only offer free returns within the UK therefore the purchaser is responsible for the delivery back to Penelope Chilvers on any exchange or return. If you a returning an order from outside the EU please ensure the package is clearly marked with 'BRITISH RETURNED GOODS’. Please note we are unable to refund any delivery, custom taxes or duties incurred outside of the UK. CAN I GET AN EXCHANGE? We can process an exchange for a different size in the same product and colour but cannot exchange for a different product. If you would like to exchange for a different product please send your original product back for a refund and place a new order online. For further information please see our delivery & returns page. CAN YOU ADD ME TO THE WAITING LIST? Of course, please email customerservices@penelopechilvers.com with the product, colour and size you are after. We will then contact if/when the product is available again. THE PRODUCT I WANT IS OUT OF STOCK ONLINE, WILL YOU BE RECEIVING ANYMORE? We often place re-orders on our best-selling products. Please email customerservices@penelopechilvers.com with the product, colour and size you are after to find out if we will be receiving a re-order. Alternatively call our Mayfair & Notting Hill stores to find out if they have the product available in store to purchase over the phone. THE PRODUCT I WANT IS OUT OF STOCK ONLINE, DO YOU HAVE ANY AVAILABLE IN STORE? Our Mayfair & Notting Hill stores may have the product available in store, please call our Mayfair & Notting Hill stores to find out if they have the product available in store to purchase over the phone. For further information on store locations & opening hours please see our stores page. HOW DO I LOOK AFTER MY LEATHER LONG TASSEL BOOTS? Protect with a suitable spray following the manufacturers guidelines. We recommend regularly (approximately 4 times a year) nourishing this leather with our Penelope Chilvers leather feed. Store in the dust bag provided. WHAT ARE THE MEASUREMENTS OF THE LONG TASSEL BOOT? 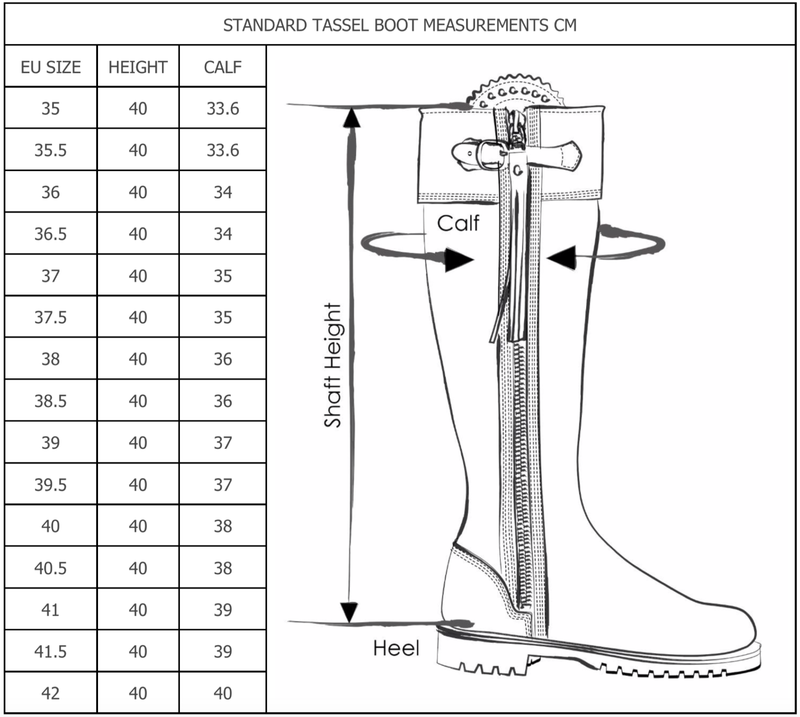 WHAT ARE THE MEASUREMENTS OF THE STANDARD TASSEL BOOT?